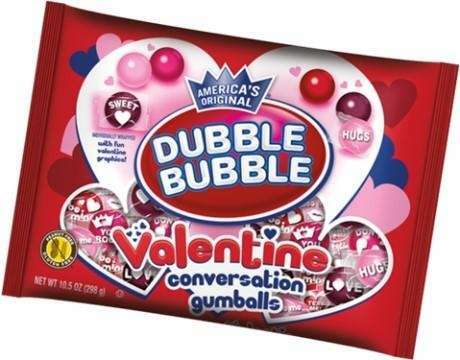 Many of the big candy makers are offering a new take on Valentine’s Day this year, including mini-messages on wrappers, gift boxes with sweet sayings and more. Whatever your children (or grown-up dears) crave, there’s a sweet out there for them. 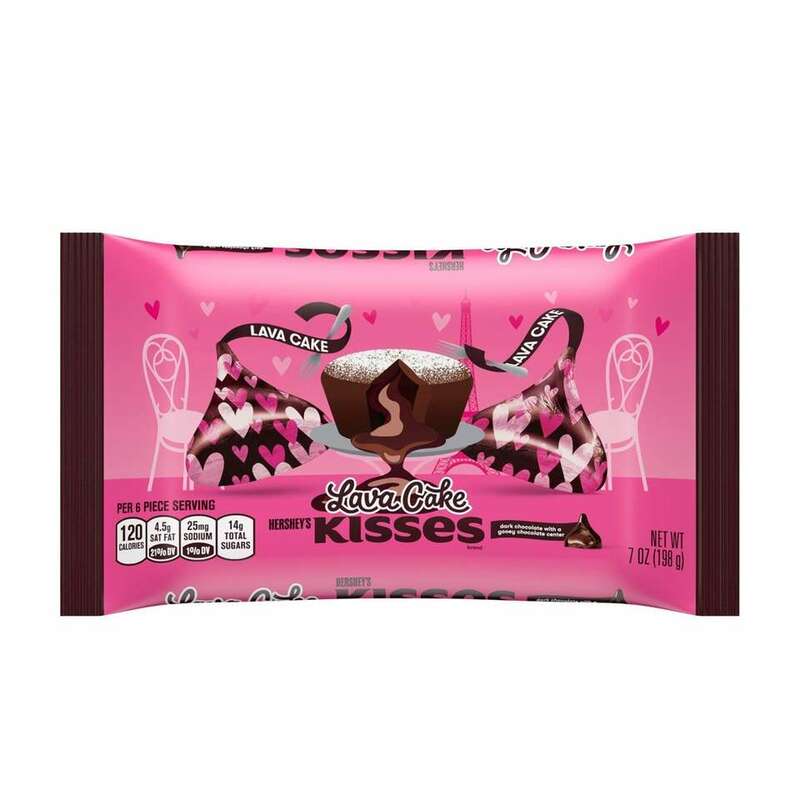 The new Hershey kisses flavor combines a dark chocolate shell with an oozing chocolate center; $3.19 (7 oz. bag), $3.79 (9 oz. 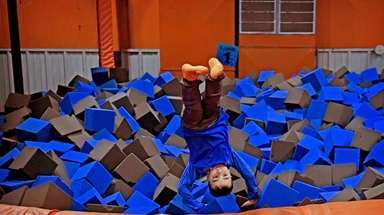 bag). 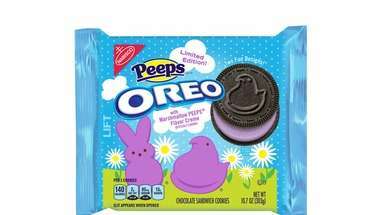 The seasonal spin on Oreo cookies feature the traditional chocolate wafers with a sweet and tangy pink flavored cream, according to the package. 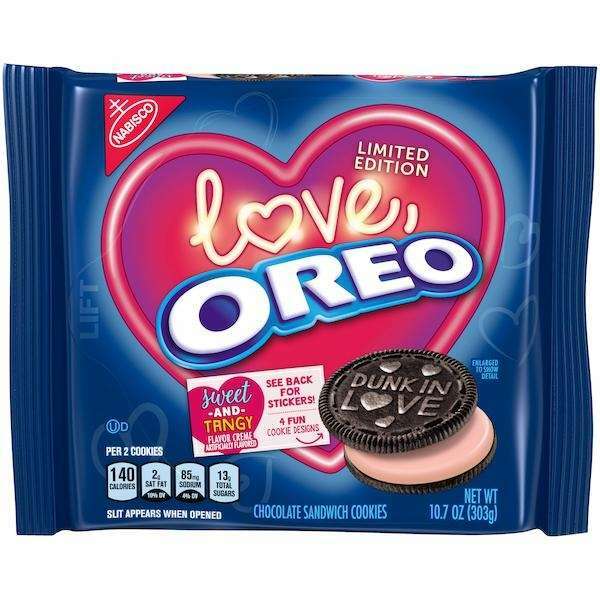 The cookies come with four different designs, including "Dunk in Love," "Let's Twist" and other Valentine's Day messages; $2.99. The limited edition Cupcake Collection from Godiva features four white, milk or dark chocolate cups with decadent flavor such as nutty praline, ganache and mousse. Some flavor combinations include white chocolate and strawberry, coffee ganache with caramel swril and more; $35 for a paper heart box with 14 pieces. 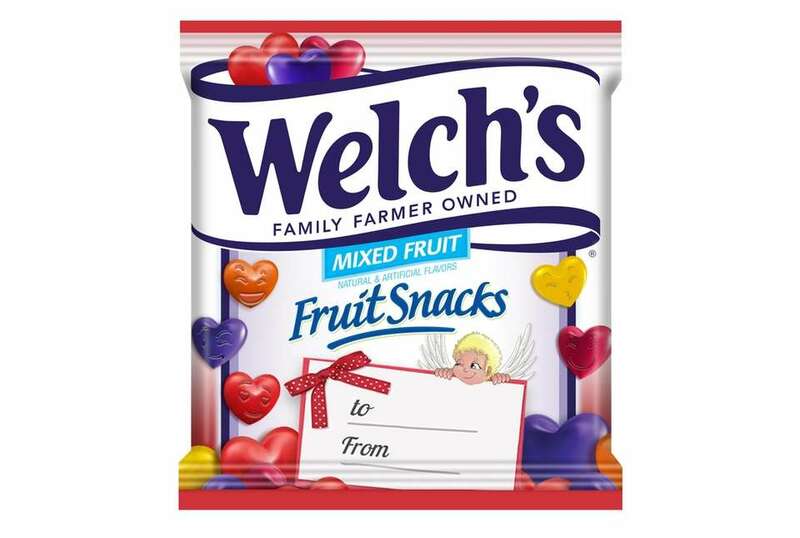 These small heart-shaped candy comes in three flavors: watermelon, strawberry lemonade and fruit punch; $2.69. 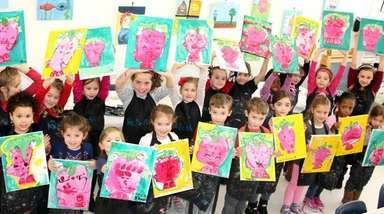 Each bag features 10 different wrapper designs with fun messages like Sweet and Hugs. The gumballs come in shades of red and pink in cherry, watermelon, pomegranate and raspberry flavors; $2.99 for a 10.5 oz. bag. A great treat to give to your friends for Galentine's Day, the chic box features Beach Buddies and Apple Frogs gummies. Each box comes with "Plenty of Fish in the Sea" and "Stop Kissing Frogs" sentiments; $20. 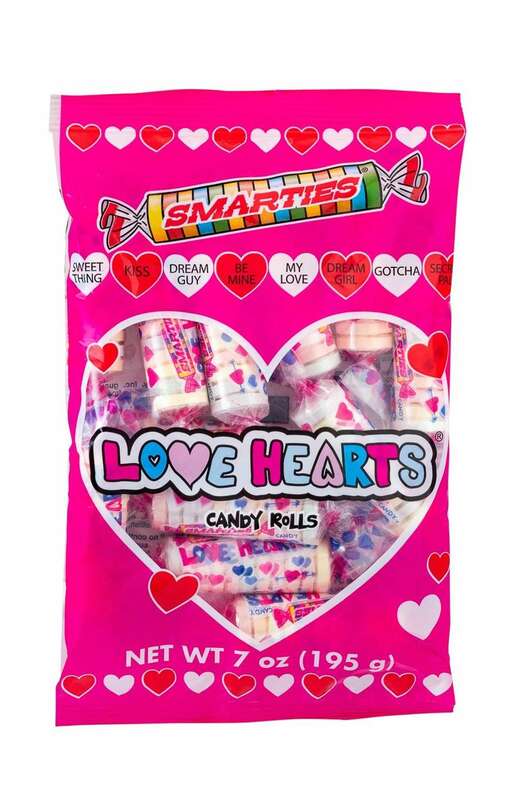 These classic candies are giant-sized and embossed with sweet messages, such as My Girl, Cutie Pie, On Fleek, Crazy 4 U and more; $12 for case of 12, 7 oz. bags. 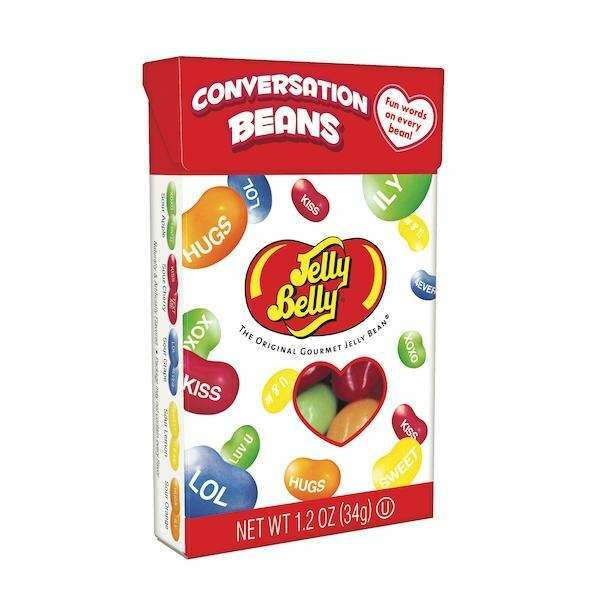 These sour jelly beans are stamped with a Valentine's Day message, like LOL, Kiss, XOXO; $1.50. 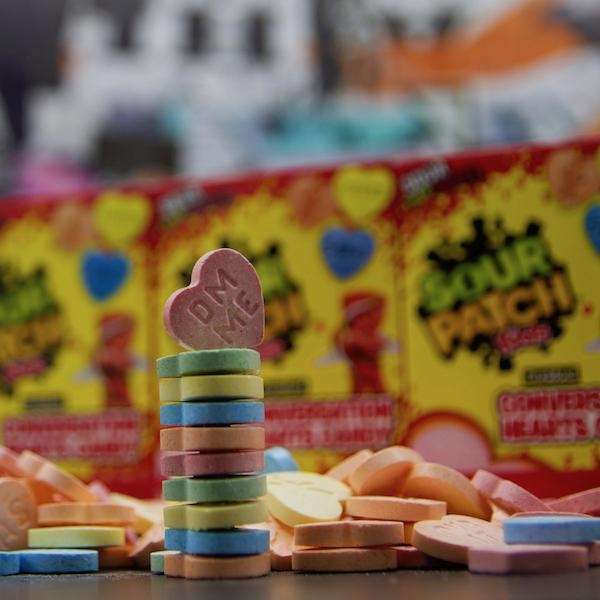 These Sour Patch Kids-flavored hearts feature a variety of trendy messages, such as "DM Me" and "Totes," as well as Sour Patch Kids figures; $2.49 for a 13 oz. bag. 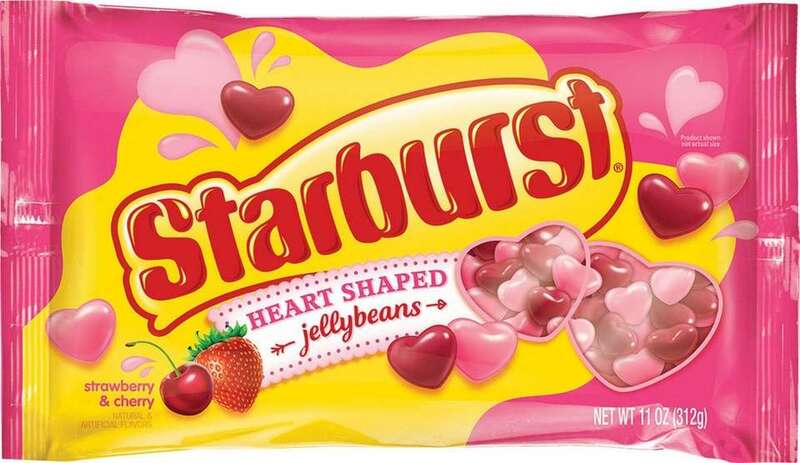 Traditional Starburst candy got a Valentine's Day makeover with these strawberry and cherry heart-shaped jellybeans; $2.99. 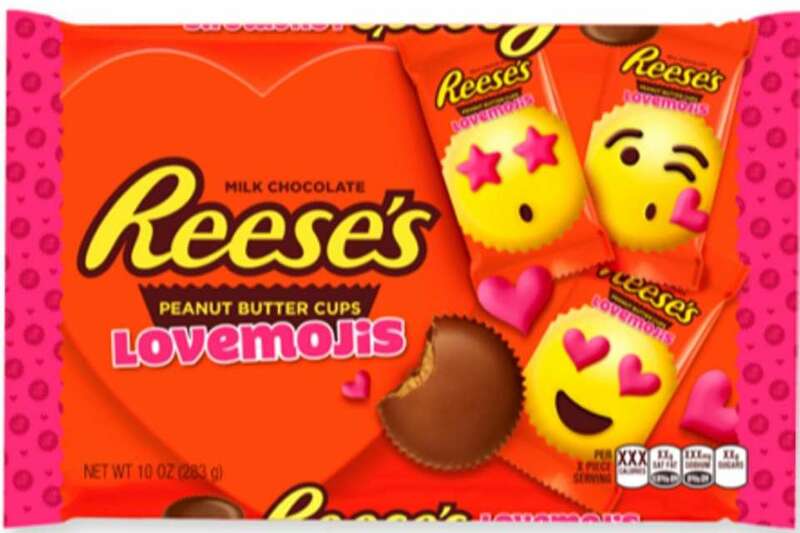 This Target exclusive features individual Resse's Peanut Butter Cups in cute emoji packaging; $3.59. Available Jan. 21-Feb. 14 in Baked by Melissa stores and on bakedbymelissa.com, these bite-sized cupcakes come in strawberry, vanilla cream and red velt with festive icing designs; $9 (6-pack), $32 (25-pack). 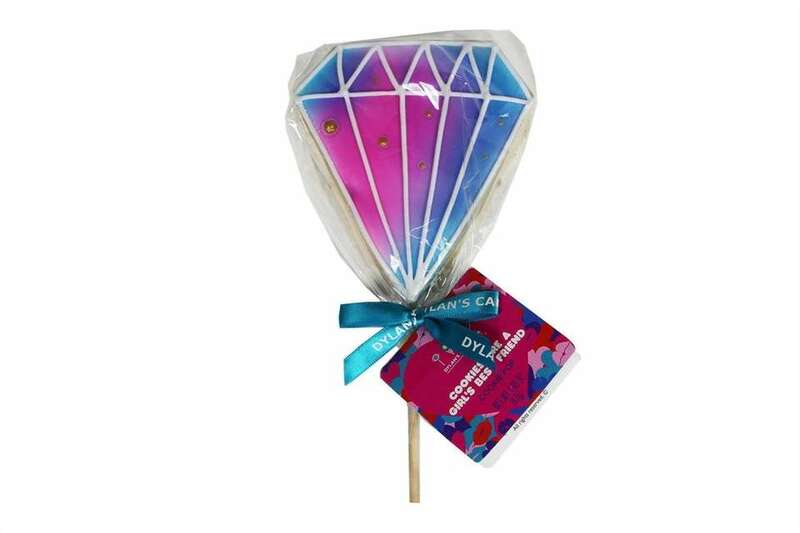 This Target exclusive vanilla cookie pop is diamond-shaped with shimmery ombre icing and gold details; $1.99. 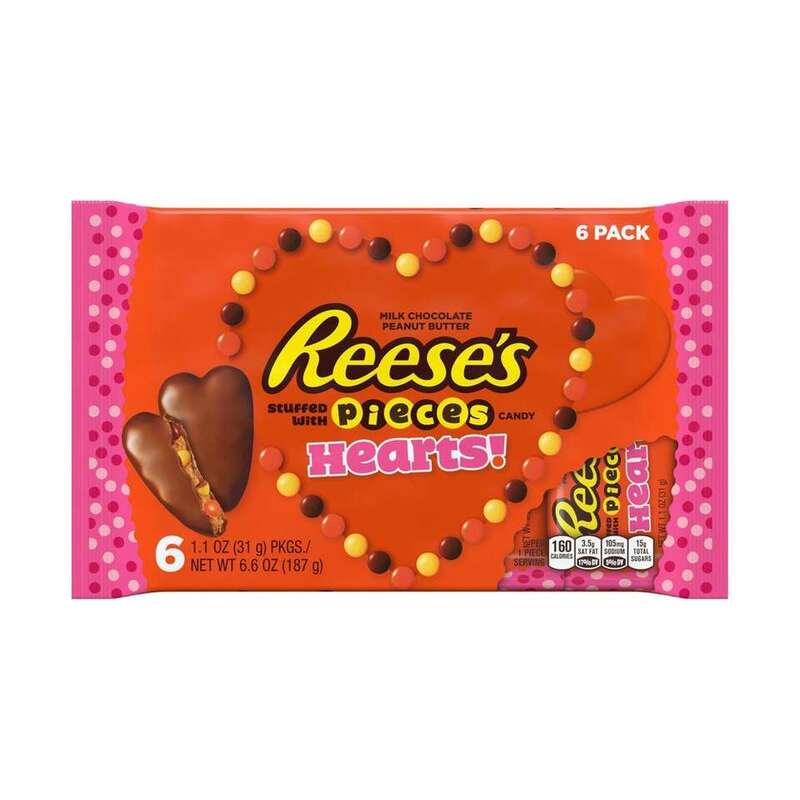 These seasonal hearts are filled with creamy peanut butter and stuffed with Reese's Pieces candy; $4.29 (6-pack). 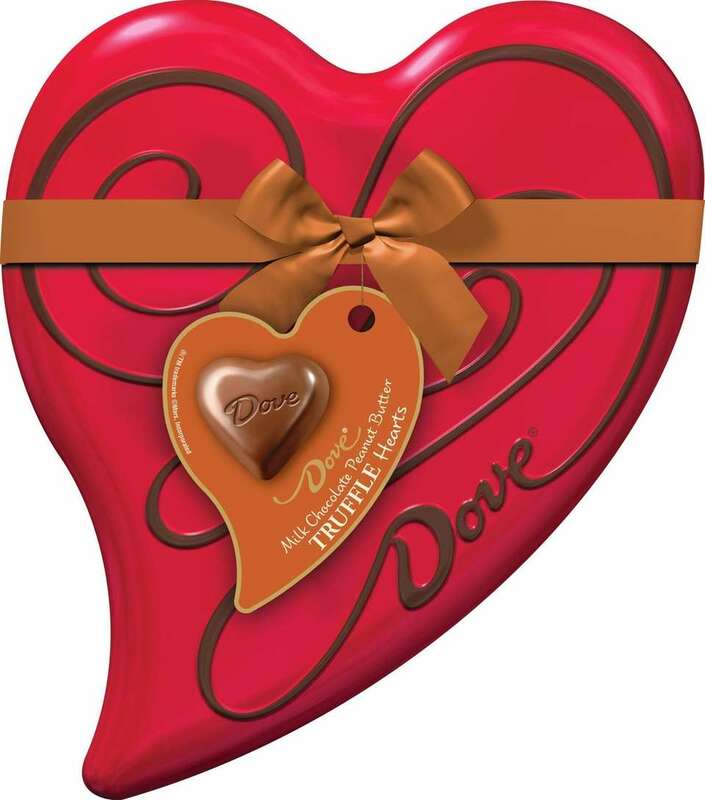 This sleek-looking heart tin holds silky smooth chocolate peanut butter truffles; $9.99. Filled with an assortment of gumballs and Valentine's Day candy corn, this Target exclusive paint can makes a sweet gift; $5.99. 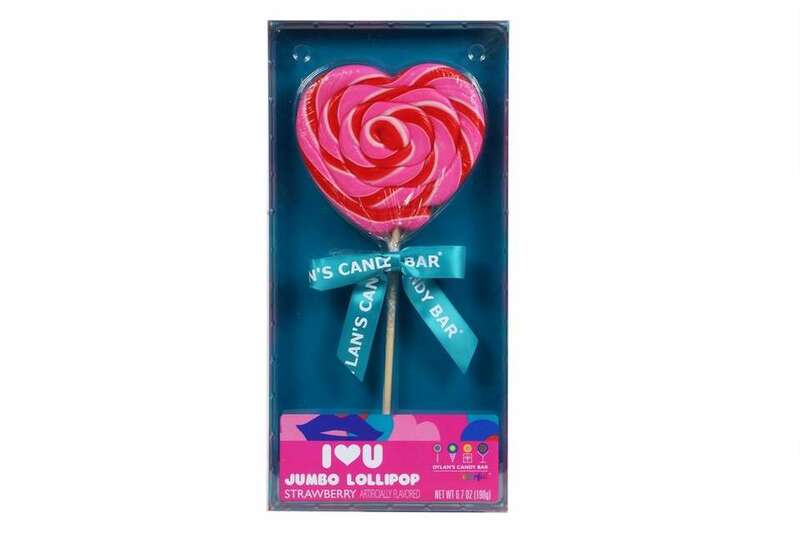 This gem-shaped lollipop is a Target exclusive and comes in cotton candy, strawberry and blue raspberry flavors; $1.99. 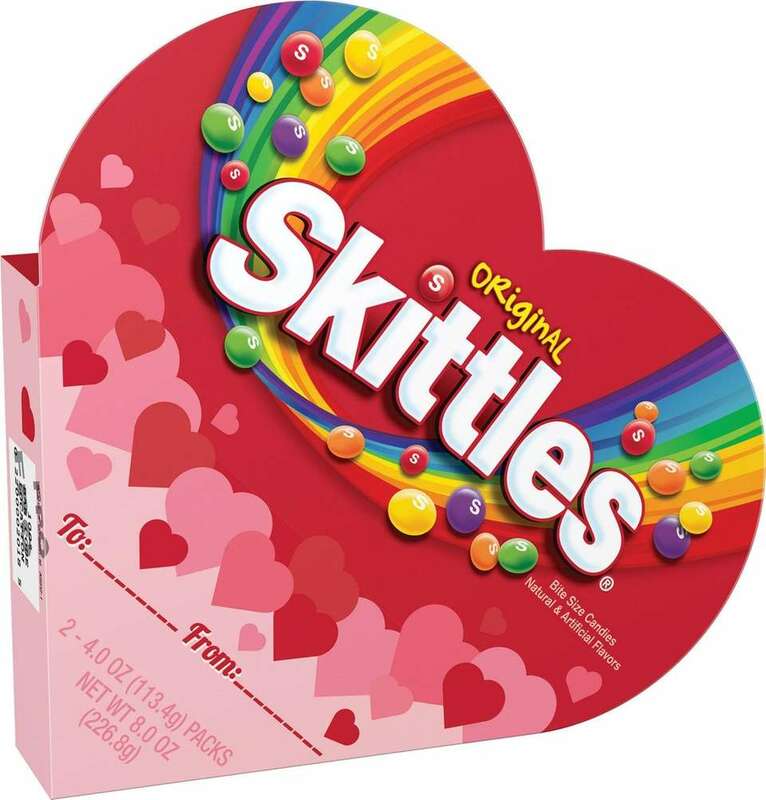 This Skittles filled heart features two packs of the bite-size chewy candy in grape, green apple, strawberry, orange and lemon flavors; $2.99. 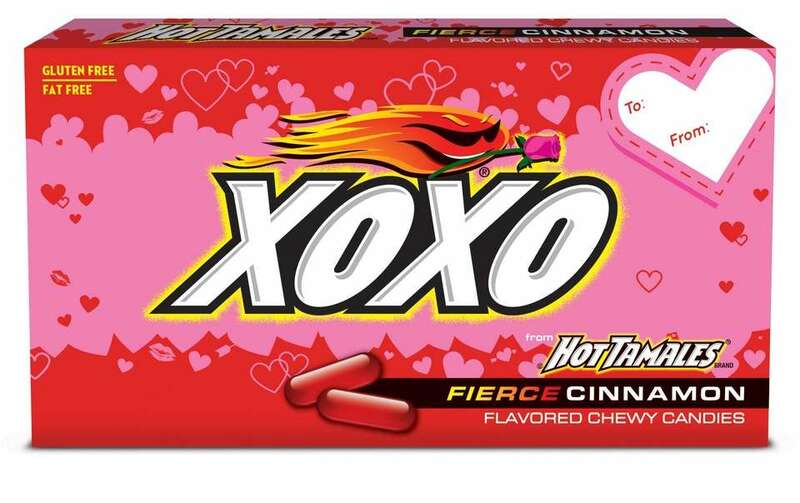 Personalize these chewy red twists with a special Valentine's Day message; $1.49. 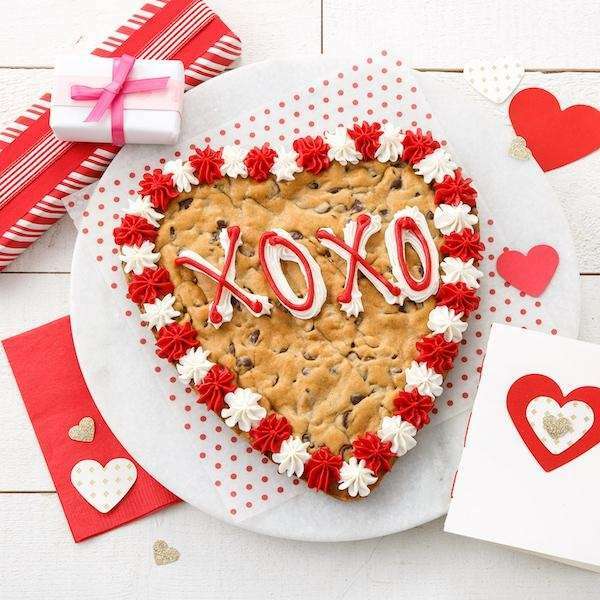 Personalize a heart-shaped cookie cake from Mrs. Field's. The chocolate chip cookie can be customized with a message and icing color of your choice. The cookie cake can also be delivered; $24.99. 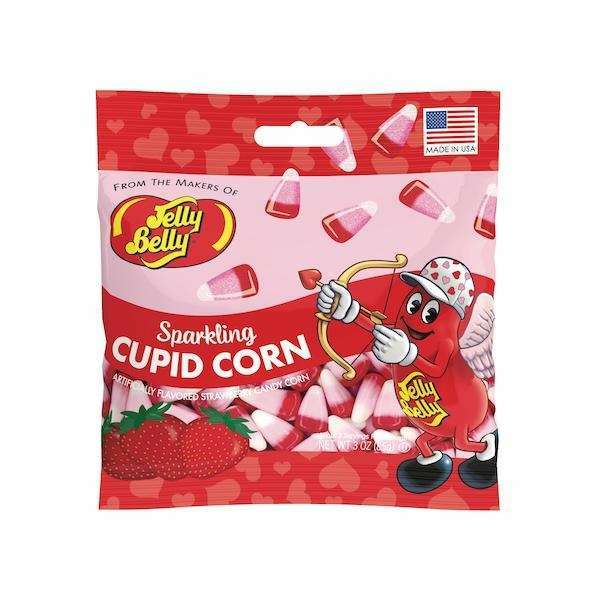 Perfectly named for Valentine's Day, this Cupid Corn is strawberry-flavored in red, pink and white with sparkling shimmer; $2.99. 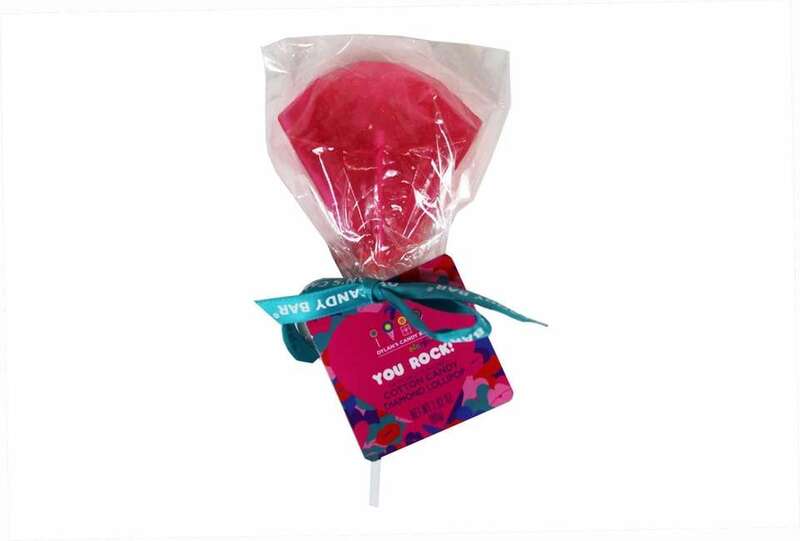 This oversized swirl strawberry-flavored lollipop comes in a heart shape with Valentine's Day sentiments on the package; $4.99. The 6 oz. 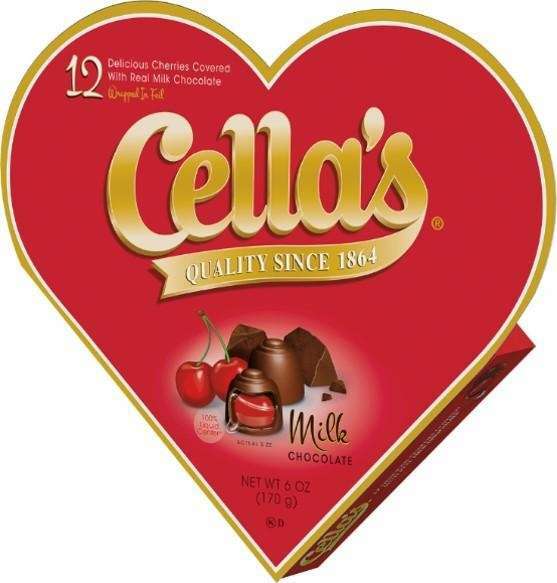 heart-shaped box features red foil wrapped chocolate covered cherries, with a 100 percent liquid center; $4.99. 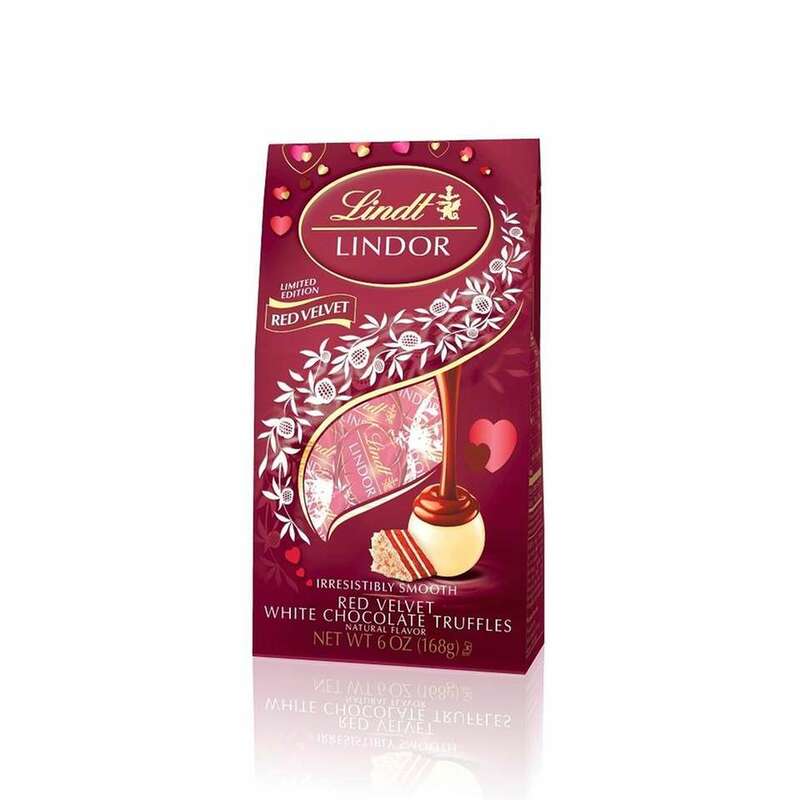 These heart-shaped treats feature a hazelnut encased in a thin wafer shell filled with nutella/hazelnut cream and covered in milk chocolate and chopped hazelnuts and walnuts; $5.29. 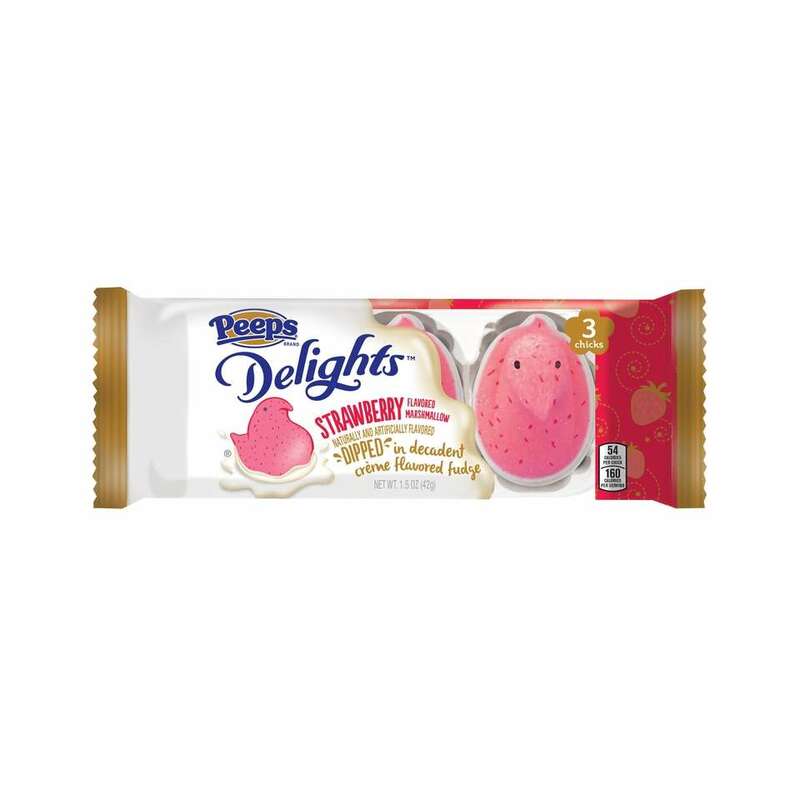 These strawberry-flavored marshmallow chicks come dipped in smooth fudge. Price: $1.99-$2.49 for a 3-count package. 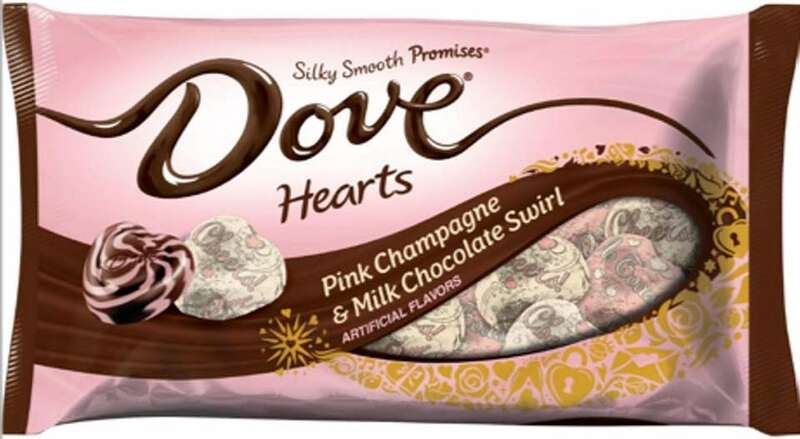 This Target exclusive features individually-wrapped white chocolate candy with toffee pieces. Price: $4.49. This Valentine's Day-themed treat box features 28 individual packages of heart-shaped pieces with emojis printed on them. Each pouch features a "To/From" signable front panel; $4.99 for a box of 28. 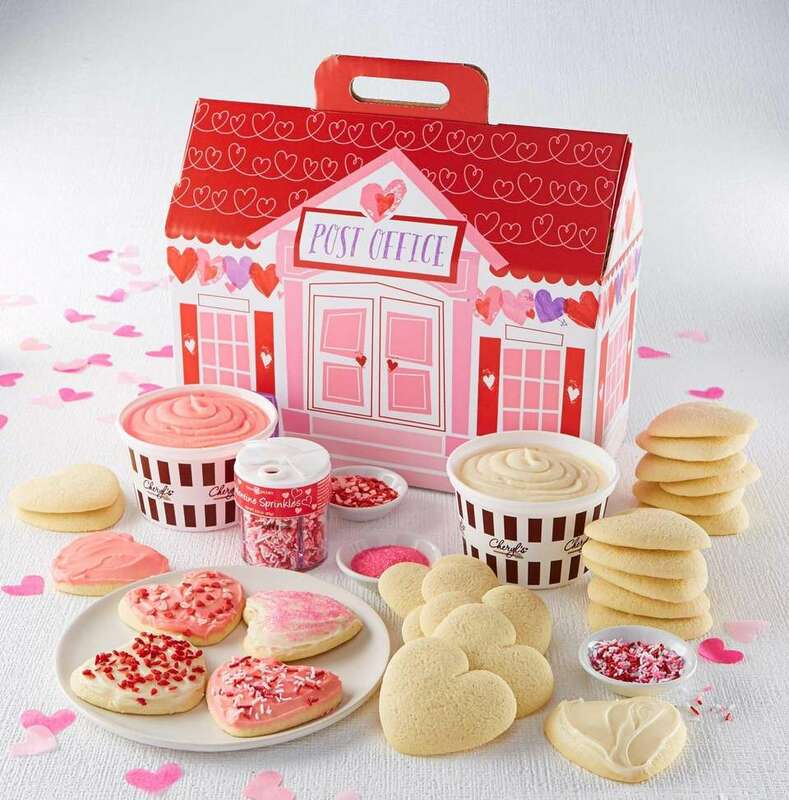 This complete decorating kit includes 24 heart-shaped cut-out cookies, vanilla and pink icing and Valentine's Day sprinkles; $39.99 at cheryls.com. 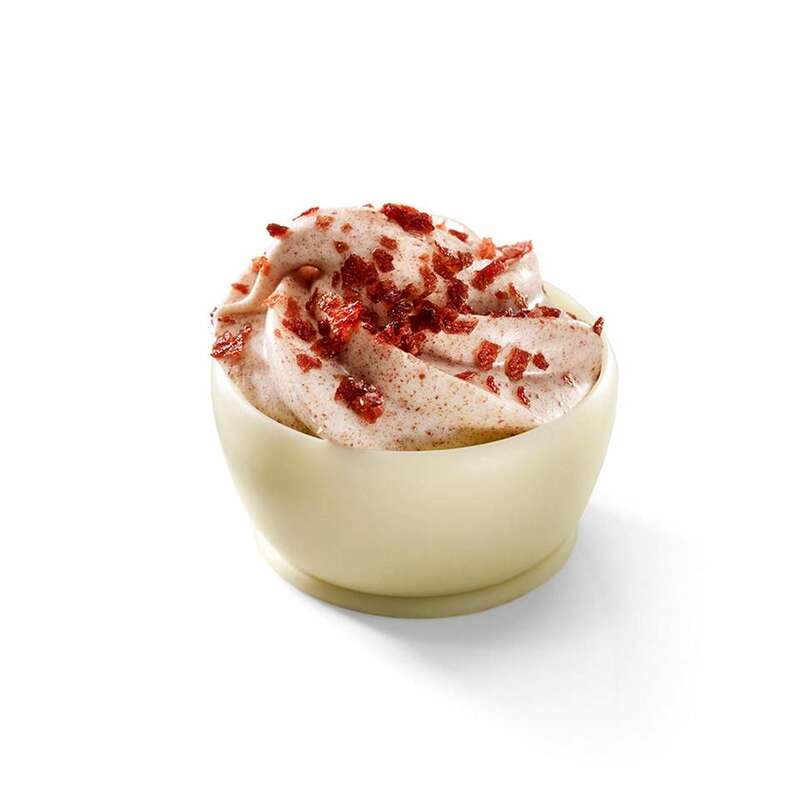 A Target exclusive, these white chocolate truffles come with a melting red velvet flavor center. Price: $4.49. 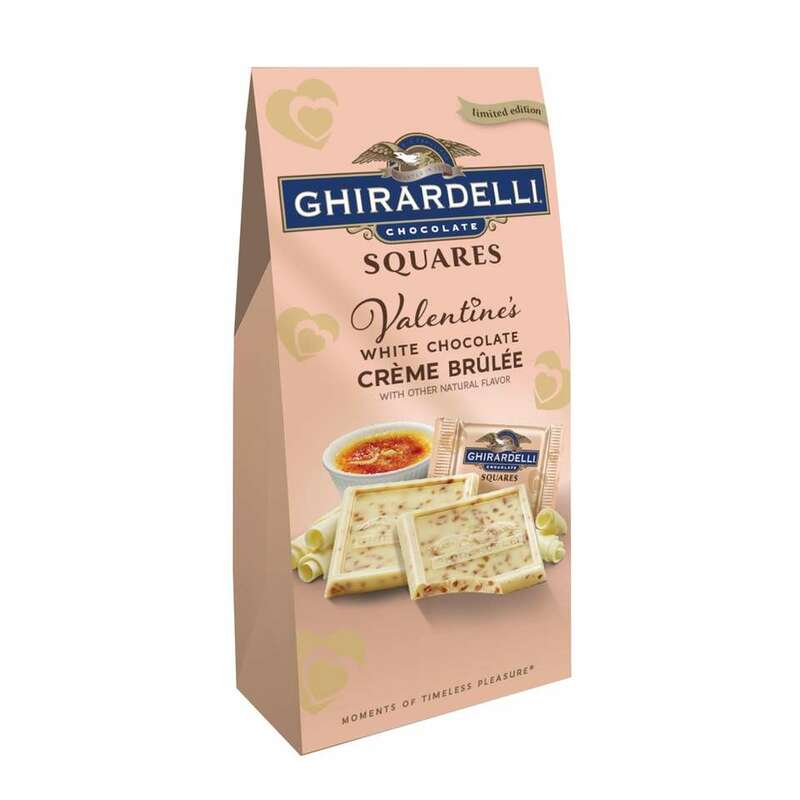 These classic candies in Fierce Cinnamon get a Valentine's Day twist in three unique boxes. Choose from "XOXO," "On Fire" and "Hottie." Price: $2. 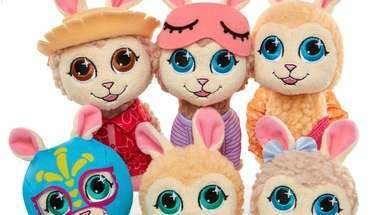 Sweet Valentine's Day gifts for your little lovesLove is in the air and you may be looking to buy your little one something special for Valentine's Day.